The true form of Lucemon which operates Satan Mode as its shadow. It hides itself within the orb of darkness carried by Satan Mode, "Gehenna", and its existence is said to be the epitome of Lucemon's evil will. 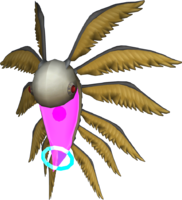 Lucemon (Satan Mode) is a shadow and its true form is the Lucemon Larva, the epitome of Lucemon's evil will. Because it exists within the dark orb "Gehenna" carried by Satan Mode, every attack is nullified by the "Gehenna", and doesn't reach Lucemon Larva. The true form which operates Satan Mode, the avatar of its evil. It is minuscule, and exists within the orb carried by Satan Mode. It possesses a will, and is able to speak. The true form which exists within the dark orb carried by Lucemon Satan Mode. 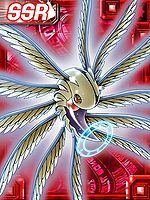 It is the epitome of Lucemon's evil will, and even after Satan Mode was defeated it tried to launch an attack on Susanoomon. | Luce (「ルーチェ」 Rūche) means light, and is a reference to Lucifer (Lat. "light-bringer"), a royal title that is commonly considered Satan's name before his rebellion. | Larva (「ラルバ」 Raruba) is the immature feeding stage of an insect that undergoes complete metamorphosis. Anime/Manga Digimon Frontier: "Fight Susanoomon, Lucemon Reaches The Human World!!" Launches energy bolts from its stinger. Divine Atonement  ディバインアトーンメント Dibain Atōnmento Summons a pillar of evil energy to attack the enemy. 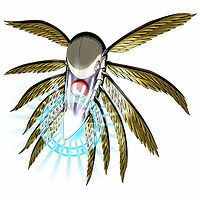 Lucemon Larva lived in the dark area Lucemon: Satan Mode carried, where it controlled all of its movements. When Susanoomon discovers this, he knocks the Larva out of the dark area, causing Satan Mode to go berserk. Susanoomon destroys the puppet, but Larva lives on, trying to kill Susanoomon with its stinger. 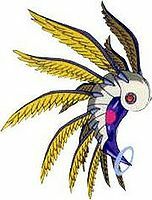 The 10 Spirits inside Susanoomon shove the Chosen out of his body, then combine their strength to kill Lucemon once and for all. 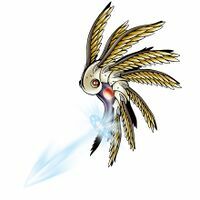 Lucemon: Larva is an available Burst Mode Evolution for Lucemon: Falldown Mode. It can be unlocked if level 70 or above with the item Source of Darkness. 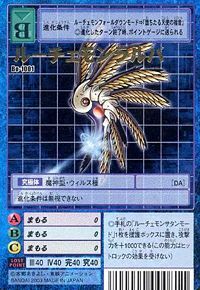 Lucemon Larva can only be obtained as a collectible card. 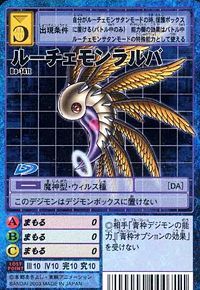 Its card is part of the The Strongest and Wickedest Demon Lords (最強最悪の魔王 Saikyō Saiaku no Maō) set. 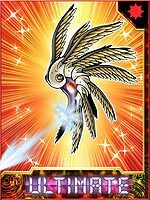 Lucemon Larva is available as a Digimon Medal. ↑ Fight Susanoomon, Lucemon Reaches The Human World!! ↑ This attack is unnamed in the Japanese version, but is called Ensure or Protect in Digimon Masters. This page was last modified on 22 March 2019, at 21:00.